When free camping away from mains 240V power what is the best way to cook or heat water or food. We all love a campfire and campfire cooking is the most effective heat source but not always available or is prohibited in some parks. Generators can be used but are heavy, noisy and also prohibited in some parks. Inverters are a good source of 240V power but the inverter required to power a frying pan, kettle or toaster will need to be quite large. Typically these are around 3000W and will need a large battery bank to run them. You then need a way to recharge these batteries when you have drained them. To boil your 240V kettle that uses 2000W may take 5 minutes. This will require a 3000W inverter and at least 200aH battery capacity. The power drained from the battery would be around 25aH (Almost what a portable fridge uses in one full day). You can see that it is not an effective way to boil water when free camping. An electric frying pan uses similar power and to cook your breakfast could take 10 minutes or more. Possibly 40 or 50aH. The preferred method is gas, it is fast and efficient. Gas refills are freely available and relatively cheap. 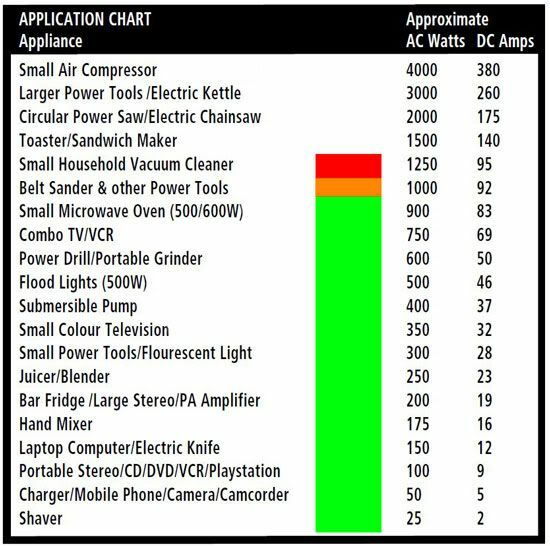 Inverters are best used for small appliances when free camping such as computers, laptops, TV’s, lighting and small battery charging. Here is a typical usage guide for a 1000W inverter.